The creation of a good cigar requires 3 crucial fundamentals: the knowledge of the variety (the plant’s genetics), an understanding of the terroir (the field’s environment), and the achievement of appropriate expertise (the know-how). Now, a great cigar emerges when everything is understood and put together following one last secret ingredient: devoted passion. And this requires knowledge, love and perseverance. Any cigar can invoke enthusiasm and fervour, but the true eye in search of genuine personality is absolute. By themselves, the eye feels and the personality speaks. All along their passage through the heart of the elements Earth, Air, Fire and Water, our black tobacco plants live a journey of biological, physical, and chemical evolution. The seeds transform to crude green leaves before becoming noble brown leaves. The alchemy of blending and rolling then consecrates the last touch of the process of the birth of exquisite cigars. Throughout the whole cigar production process, some 300 different operations are essential to achieve outstanding final quality. Any small inattention or inaccuracy can ruin the promise of a great cigar and spoil previous energy and efforts. Every single step is to be done with application and resolution, contributing to the excellence of the production. Totally naturally, the most basic elements of life give birth to the most refined object of pleasure. 100% organic, a great cigar is a product of nature. Combining Art with Science, Passion with Reason, Perseverance with Tolerance, we are proud to present our Nicarao cigars. We enjoy what we do and love what we produce. 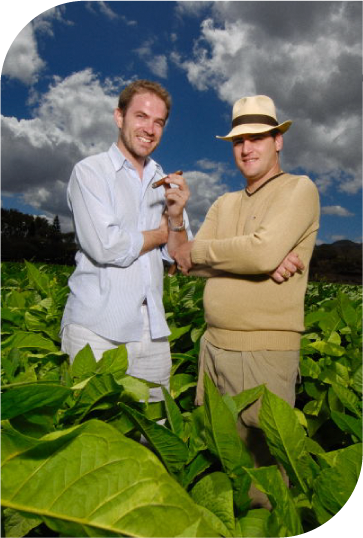 We do our best to deliver the warmth of those feelings and concepts into the aromas and tastes of our cigars. Taste with emotion and perceive the personality of our Nicarao Cigars.